A vast mountainous region occupies the whole of the west of Tunisia. On the menu: fresh air, green activities and uncovering countless historical ruins. The white domes of the Sidi Boumakhlouf mosque watch over the medina of Kef, cascading in stages down the mountainside. Explore narrow streets and stairways, and you will encounter the many relics dating from Antiquity scattered around the old town. Visit the former synagogue and the Museum of Popular Art and Traditions, which is housed in a former Islamic mausoleum: the evidence of religious coexistence can be found in several traces throughout the city. 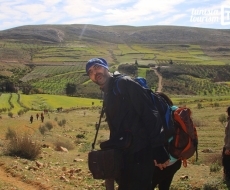 Climb up to the Ottoman citadel which faces a superb panorama of forests and fields. Why not visit Kef in the springtime? The surrounding landscape is flush with greenery, while the city comes to life for its international theatre festival followed by a millennia-old celebration, the Mayou festival. Staying in the Tunisian “Wild West” means finding oneself at the heart of a natural world preserved in the principal mountainous region in Tunisia, the Dorsal. Its highest peak, Mount Chaambi, is 1544 metres high. Let yourself be won over by an incredible sense of freedom by blazing a trail through a pine forest, galloping along a wadi (river), or by crossing a reservoir lake aboard a barge… This still mostly untouched region offers wide open spaces and arresting scenery. Ancient history has left numerous traces in the Tunisian West. During your excursions, you will have surprise encounters with a Roman arch of triumph, dolmens by the dozen, prehistoric caves, the arcades of a historical theatre or the pools of a former Roman baths. Sufetula, the principal city of Tunisia during the Byzantine period (6th-7th century), can be found on the high plateaus; known today as Sbeïtla it is a striking archaeological site that should not be missed. Kef and Kasserine are the principal cities of this region which, furthermore, abounds with archaeological sites; the most spectacular are Sbeïtla, Makthar and Haïdra. Be sure not to miss Jugurtha’s Table, a unique historical and natural site. Heir to an ancient city, Kef has preserved many Roman remains within the city itself: baths, cisterns, basilica, church… It also contains a multitude of mausoleums and sanctuaries of Sufi saints such as Sidi Boumakhlouf, the patron saint of the city. One of them today houses a magnificent museum which retraces the different ways of life of the townspeople and the Bedouins of the area. Equally, the synagogue and Jewish cemetery in the old town speak to a Jewish presence in Kef right up until the end of the 20th century. Above the medina the great Kasbah (citadel) rises up, built in the Ottoman era. Here the Turkish janissaries were garrisoned facing Algeria to guard the frontier. A true natural fortress, this 80 hectare tabular mountain is entirely surrounded by steep cliffs. The only access: a narrow staircase carved into the rock. Legend has it that the Numidian chief Jugurtha, at war with Rome, withstood months of siege; other rebels have taken shelter there throughout the centuries. Search for traces of these historical occupations (cisterns, granaries, underground shelters…) or content yourself with appreciating the superb view. Elles is a small village in western Tunisia located between the city of Kef and the archaeological site of Makthar. It is actually in the heart of a vast city of the dead. 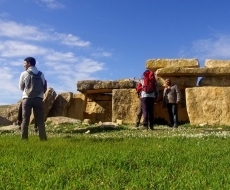 There are 71 megalithic tombs scattered over 8 hectares, some of which are well preserved. These were collective tombs that gathered the burials of many dead. At the end of the period of Antiquity, the West of Tunisia was covered with churches and Christian chapels. The ruined church in the city of Thala is worth a visit, as well as one of the largest Byzantine fortresses of the Maghreb in Haïdra. An arch of triumph, a dam, two mausoleums and many more ruins… the city of Kasserine, surrounded by high mountains, held an important strategic role in the Roman and Byzantine eras. This extraordinary historical site is well worth the journey. The Roman theatre and Capitol, the Numidian mausoleum, the countless ruins of temples, baths and houses form a remarkably preserved historical town. Dougga has been declared a World Heritage Site by UNESCO. A major mining city, Gafsa is bordered by the northernmost oasis in Tunisia.. The foothills of the Saharan Atlas, south of Gafsa, form unique landscapes. In this mineral universe oases appear deep into the mountains: Chebika and its oued (river) tumbling down the mountain, Tamerza and its waterfall, Mides suspended above an imposing canyon.